Pizza is dish that originates in Italian cuisine, although it has become popular around the world, and the recipe has been adapted to suit country's tastes. Most forms of pizza are made from oven-baked flat bread, topped with tomatoes or tomato sauce and cheese (often mozzarella). Other ingredients may also be added to topping depending on the recipe being used. Sicilian-style pizza (Italian: Sfincione) - A version of pizza with the ingredients incorporated into the dough, rather than placed on top. Small chunks of pecorino cheese are used instead of mozzarella cheese, and the dish also incorporates chopped up anchovies. Ripieno and calzone - A half moon shaped pizza, filled with mozzarella, ricotta, and salami. It can be either baked or fried. Marinara - Topped with tomato, garlic, oregano and extra virgin olive oil. Margherita - Topped with tomato, sliced mozzarella, basil, and extra virgin olive oil. Margherita extra - Topped with tomato, buffalo mozzarella from Campania, basil, and extra virgin olive oil. Pizza capricciosa - Tomato, mozzarella, artichokes, mushrooms, ham, sometimes a hard-boiled egg, olive oil and oregano. Pizza romana - Tomato, mozzarella, anchovies, olive oil and oregano. Pizza viennese - Tomato, mozzarella, German sausage, olive oil and oregano. Pizza quattro formaggi - Tomato, and four cheeses, usually mozzarella, fontina, gorgonzola, and stracchino. Pizza quattro stagioni - This pizza is similar to capricciosa, but different toppings are placed in separate quadrants of the pizza rather than mixed. 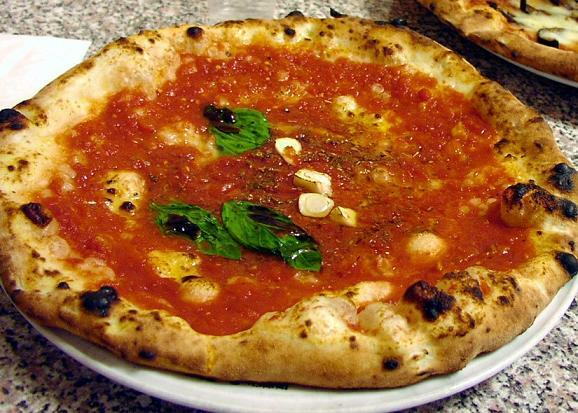 Apizza - This style of Neapolitan pizza originated in New Haven in Connecticut. It is an irregularly shaped pizza topped with hard cheese and garlic. Other toppings are also sometimes added as well. Chicago-style pizza - This is a very deep-dish pizza that originated in Chicago. 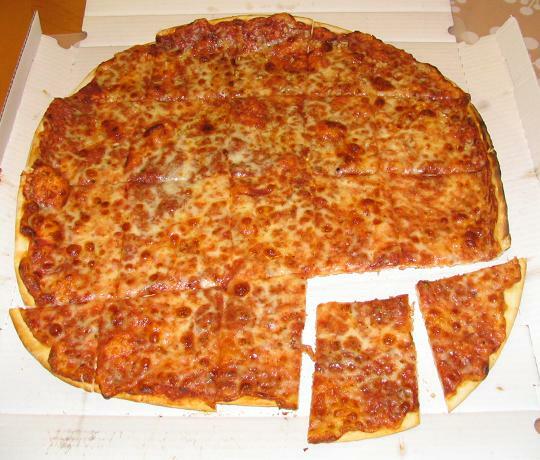 Flat pizza ("party cut") - This is a thin crunchy pizza, which is also originally from Chicago. It is cut into small squares before eating. 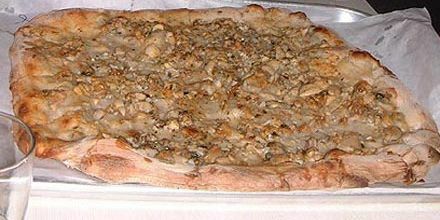 Greek pizza - This style of pizza is popular in New England, and was introduced to the region by Greek immigrants. Greek pizza has a thick chewy crust, and is baked in a pan in the oven, rather than directly on bricks. The toppings are often inspired by Greek cuisine, and include feta cheese, olive oil, olives, and oregano. New York-style pizza - This style of pizza comes from New York city. It is a very thin pizza, and is cut into very large wide slices. A flat slice is too big to fit in your mouth, and the traditional way to eat it is to fold each slice when eating it. 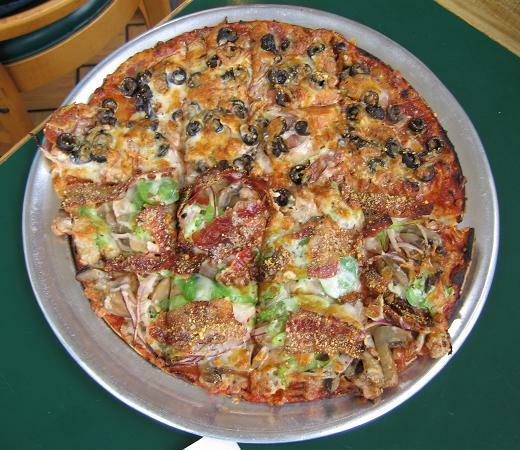 St. Louis-style pizza - This styles of pizza comes St. Louis, Missouri. It has a thin crust, and is notable for using Provel processed cheese, which is in fact a mix of cheddar, provolone chess, and Swiss cheese.